Adderall and Red Bull. Pringles and cigarettes and scotch. More Adderall and more Red Bull and, if you mix them in just the right way and shake violently for months, you might end up with a videogame. He’s a writer in an industry that doesn’t understand writers. Or value them particularly highly. He’s a writer of stories that will never (or almost never) carry his name anywhere but in an endless scroll of credits that almost no one will watch. He’s a writer in a place that would be alien to almost any other writer working — where writing is done by committee, or gets thrown to the person who protests least, or who remembers this one really good Dungeons & Dragons game they played in high school, or to the person who can write a thousand different variations on someone saying hello without going insane. In Williams’s case, he got it by being the loudest, angriest, most egotistical kid in almost every room he walked into for ten straight years. And also because he cared deeply about telling stories and their impact on the human condition and blah blah blah. But mostly because of the anger thing. And because, for a brief time, he carried a pink softball bat with him everywhere he went. The book reads like Portrait Of The Artist As A Young A-Hole — a blow-by-blow accounting of how to survive and succeed in an industry that lives on 20-hour days and 7-day workweeks, that considers energy drinks and ADHD meds important food groups. Which, depending on how you look at it, is either laudable in its honesty about an industry that loves secrets or disturbing in its lack of authorial self-consciousness. What if Williams is literally right? What if that very simplistic fear — imposter syndrome, the concern that people will find out you have no idea what you’re doing — actually is the prime driver behind so much of what happens in the videogame industry? What if everyone is really just a kid who lied and faked and snuck and cajoled their way into their dream job, got promoted too far too soon, and is just desperately hanging on, trying not to go crazy before the story they’re telling is finished? Because, really, that’s the world Williams presents. 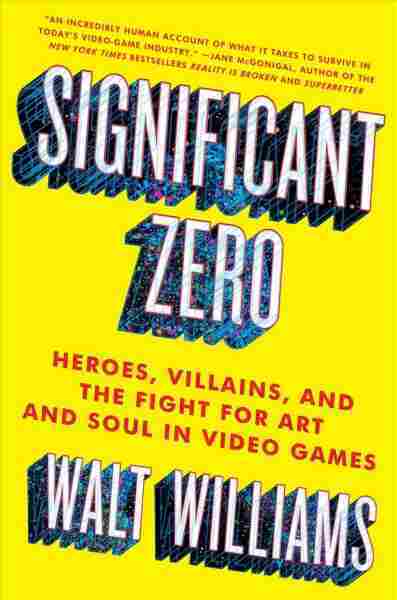 The first two thirds of Significant Zero play out like a heist story about a kid who stole his own dreams — who wanted to become an Air Force chaplain but instead became the man who made it okay for you to virtually murder a million people from the comfort of your own living room. There’s never a moment of comfort or respite, just ramping tension as he moves up through the ranks with the help of an older, wiser mentor and works himself nearly to death. In the back third, things calm slightly and become more introspective.There are moments of ridiculous bravado. It runs a bit heavy on the war metaphors. But Williams’s candor carries it. He loves what he loves and hates what he hates and shies from none of it — his love/hate relationship with the Player as gestalt, his feelings on Crunch and videogame morality, why we’re all so in love with killing onscreen. And his manic-depressive, workaholic, bitter energy makes the book a compelling look into a world that doesn’t like to spill its secrets to outsiders. It has a bright Hero’s Journey arc (complete with setbacks, small deaths) and the winning of boons through cleverness and combat. In the end, he emerges from his trails wiser, calmer, both more — and less — whole. It plays out, more than anything, like a videogame.